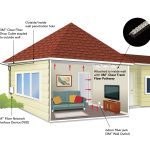 ST. PAUL, Minn.--(BUSINESS WIRE)--Customers can enjoy fast fiber connectivity in their homes with a new FTTH pathway solution that is virtually invisible. The new Clear Track product family from 3M can seamlessly and inconspicuously route fiber from outside to inside residential and commercial settings, providing installers, contractors and service providers with revolutionary new resources for more aesthetic network expansions. The 3M Clear Track product family includes technology poised to set new industry benchmarks for craft-friendly installations, while creating a nearly invisible network footprint. 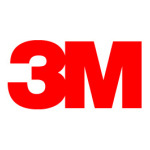 3M™ Clear Fiber Drop Cable – This all-dielectric FTTH Clear Fiber Drop cable transitions fiber cable from outdoors, where ruggedness is required, to indoors, where aesthetics are desired, without the need for a splice or connection point. 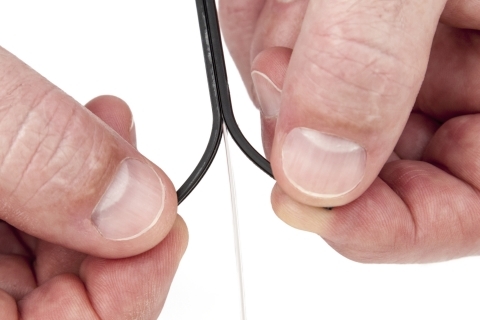 With easy-peel technology, the flat, jacketed cable opens to expose a single 900 μm clear buffered ultra bend-insensitive fiber (ITU-T G.657.B3) that’s ready for indoor routing with the 3M Clear Track Fiber Pathway. Clear Fiber Drop Cable can easily be pulled through conduit due to its low friction, low profile cable design. 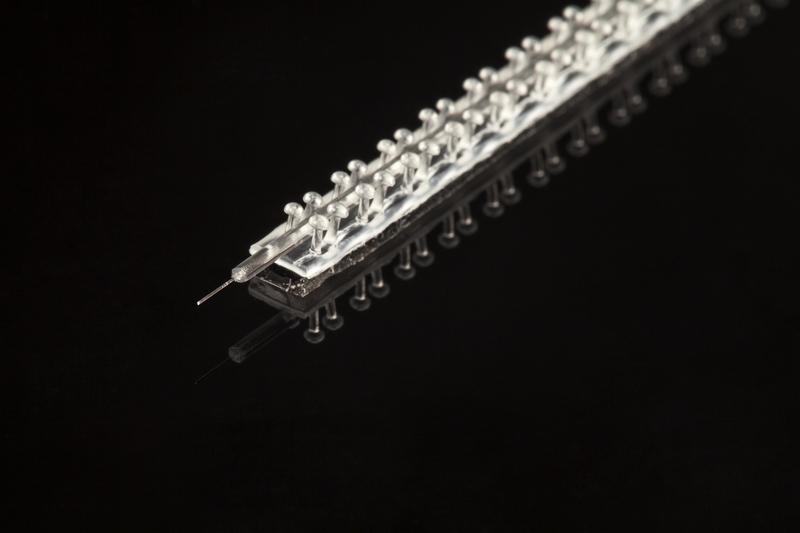 3M™ Clear Track Fiber Pathway – The Clear Track Pathway captures and routes a single 900 μm clear fiber to the desired outlet or terminal while remaining virtually invisible. The pathway features 3M’s proprietary clear tape adhesive backing with an easy-peel liner. It installs directly to most walls without staples, heat guns, glues or leaving behind a bulky raceway. 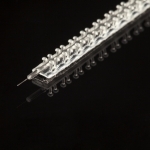 3M™ 900 μm Clear Fiber – The clear buffered and ultra bend-insensitive, Clear Fiber locks into the Clear Track pathway and provides high-performance bandwidth and low insertion loss even with multiple 90º corners. The fiber can be easily repositioned and reinstalled for convenient extensions and rerouting. 3M™ Clear Track Fiber Installation Tool – Compact and mechanical, the Clear Track Installation Tool is a hand-held rolling device that requires no power source. It secures Clear Fiber in the Clear Track Fiber pathway with required pressure and precision. The installation process requires limited training to operate. 3M™ One Pass Mini Surface-Mount Wall Outlet – Available with SC/APC or SC/UPC adaptors, the One Pass Mini Surface-Mount Wall Outlet is an equally low-profile way to complete the Clear Track FTTH connection near an ONT or customer premise equipment. This new fiber pathway and drop cable solution is set to make its official debut June 13-14 at the 2016 FTTH Connect Conference and Expo in Nashville, TN at the Gaylord Opryland Resort in Booth #730. 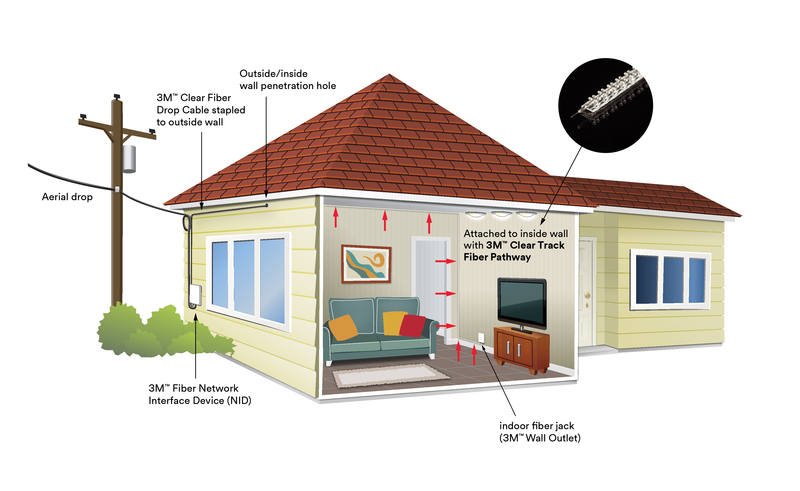 3M Clear Track Pathway answers market demands for unobtrusive indoor fiber deployment that installs easily and maintains the aesthetic integrity of interior décor. It’s proving to be beneficial in single- and multi-family units by simplifying the installation process to a few hand-held tools, as opposed to the relatively intensive labor involved with ductwork, crawl spaces, raceways or even stapling. Tenant and homeowner disturbance is minimal and the time to install is greatly reduced – a bonus for service providers seeking to roll-out fiber quickly, especially in large apartment complex, condominium or office settings. Early installations include a luxury, mid-rise apartment building in Austin, Texas, where the 3M Clear Track solution as well as 3M One Pass Hallway Pathway Solution were piloted based on their flexibility, low-profile design and unobtrusive installation process. As a world leader in communications technology, 3M is a Network of Networks connecting products, people and companies by harnessing the power of 45+ technology platforms to create customer-centric innovations. The Network of Networks connects smart buildings to smart phones, data centers to desktops, greenfield to brownfield, wireline to wireless and customers to their goals. Find out more at 3M.com/Telecom or follow @3MNetworks on Twitter.